One of the biggest reasons guided math centers fail is because students don’t have a strong foundation with the procedures and expectations. Well, a few years ago, I was making one big mistake that actually enabled this. 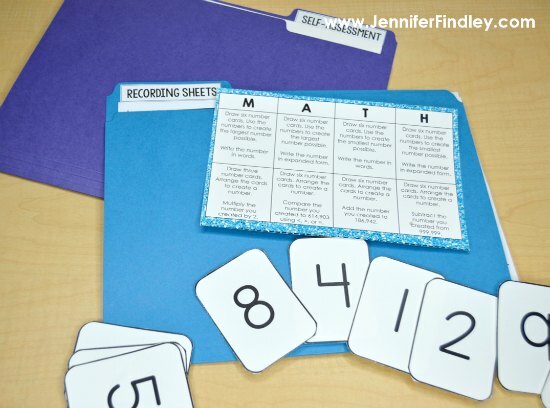 When I launched math centers, I used math centers that contained skills my students were still “soft” with: skills they had not mastered and still struggled with. Productive struggle does have its place, but not when I want my students to focus on learning the procedures and expectations of math center time. The big mistake I made was that my students were spending their brain energy and time focusing (and struggling) with the content of the math centers and not learning what MY focus was: launching guided math centers and introducing them to how it will run for the rest of the year. Once I realized what I was doing, I created 4th grade review skills (and 3rd for some of my classes) to use at the beginning of the year. These review skill centers were perfect because they mirrored the format and directions of the centers my students would see all year long. So, my students were learning the format of guided math time AND the format of the centers they would be working with. Since using review centers that mirror my existing math centers that I use all year, my guided math center launches were much more successful and our guided math time much more productive the entire rest of the year. I want to start you off on the right foot, too! So, I have created launching guided math starter packs for grades 3-5. Let’s take a look at the centers that are included in these starter packs. My students love this center, and I love how low-prep it is! This math game can be “played” independently but I use it as a partner game (so I make 2-3 copies of each game for a small group). To play, the students roll two dice, add the numbers on the dice, and then solve the problem that matches that number. 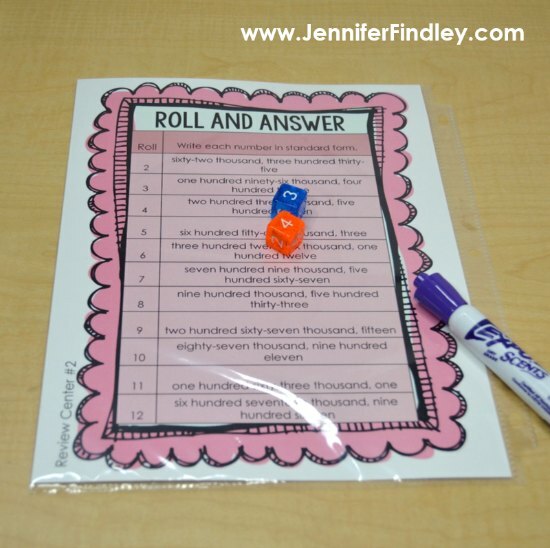 There are two roll and answer math games in the starter pack, both focusing on writing numbers. To purchase complete grade level sets of Roll and Answer Math Games to use in conjunction with the free starter pack, click on your grade level: 3rd Grade, 4th Grade, or 5th Grade. Choice is really powerful for students (well, anyone really), and these choice boards provide just that. Each choice board focuses on one skill or standard, and the students choose how they want to practice the skill. The choice boards I included in each starter pack focus on representing, comparing, and working (adding, subtracting, or multiplying-depending on the grade level) with whole numbers. To purchase complete grade level sets of Math Choice Boards to use in conjunction with the free starter pack, click on your grade level: 3rd Grade, 4th Grade, or 5th Grade. A few years ago, I noticed I needed more centers than my “normal math centers” for me to use at teacher-time, for my math interventionist to use when she worked with a group, and then to just review difficult skills in a variety of ways. I created a huge standards-based variety pack of centers full of puzzles, different task cards, and games. For the starter packs, I included a math center puzzle that reviews ways to represent whole numbers. To purchase complete grade level sets of Standards-Based Math Centers to use in conjunction with the free starter pack, click on your grade level: 3rd Grade, 4th Grade, or 5th Grade. 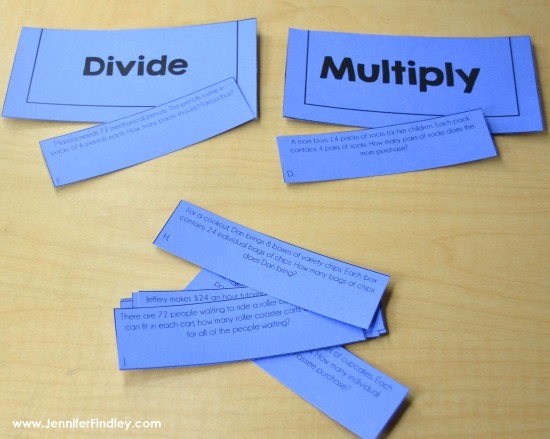 Math sorts are a fun hands-on way to have your students practice math. The sorts included in the starter packs for each grade level require the students to read word problems and sort based on the operation. 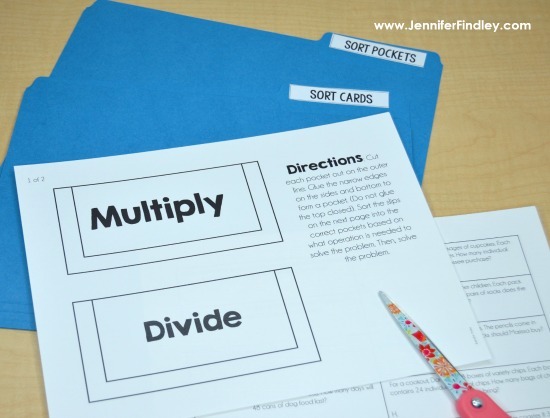 The sorts can be used in an interactive student notebook or printed on colored card-stock as a traditional math center sort. To purchase complete grade level sets of Math Sorts to use in conjunction with the free starter pack, click on your grade level: 3rd Grade, 4th Grade, or 5th Grade. 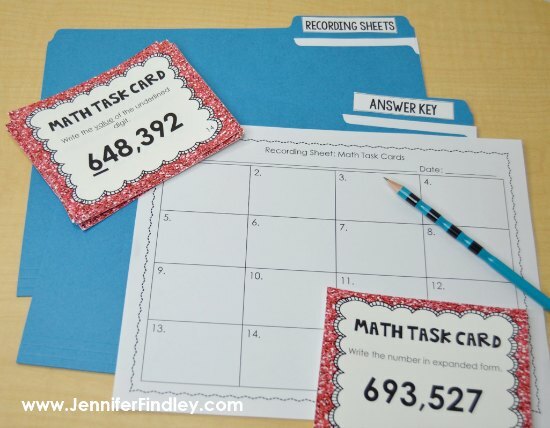 Task cards are a staple in my math instruction and can really be used for so much more than just math centers (scoot, around the room gallery walk, exit slips, and even interactive notebooks). They help provide that much needed “paper to pencil practice” without being overwhelming for the students. 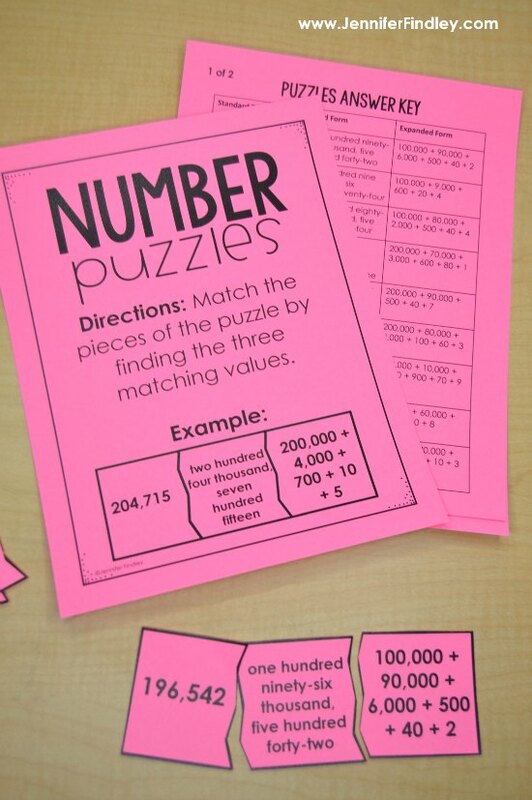 The task cards included in the math starter pack review a variety of place value skills. To purchase complete grade level sets of Math Task Cards to use in conjunction with the free starter pack, click on your grade level: 3rd Grade, 4th Grade, or 5th Grade. 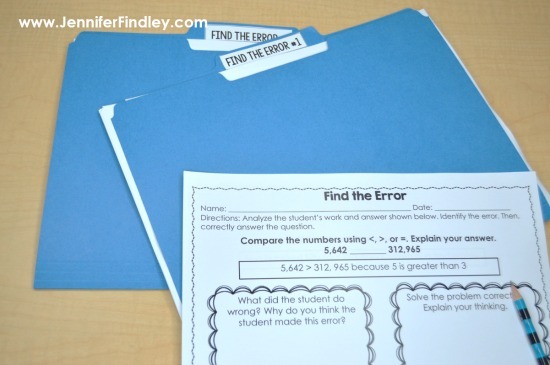 One of my students’ favorite activities are these “Find the Error” printables. They love them so much that I sometimes dedicate an entire center to this skill, but usually they are placed in a “Paper and Pencil” math center. 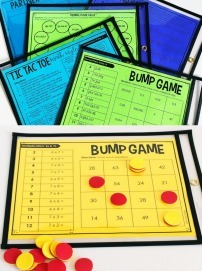 The printables included in the starter pack review representing and comparing whole numbers. Why use this starter pack to launch guided math centers? 1.) Introduce all of your consistent math centers in the first two weeks of school, if you choose to use these specific math centers. 2.) Teach and reteach the center expectations in a meaningful way (using the actual centers the students will be using all year- with only the content/skill changing). 3.) Ensure your students know the expectations of each center (quality/quantity) and how to complete each center. 4.) Clear up any misconceptions about your center expectations. How is this math center starter pack different from my complete grade level sets? As I mentioned above, I created the centers in this starter pack to mirror my complete grade level sets. The starter pack and the grade level sets differ in two ways: 1.) the starter pack reviews skills from the grade level below and 2.) the starter pack does not include any tricky skills or questioning. The content is presented in a straightforward manner to allow the focus to be on learning the procedures and expectations of guided math center time. Do I have to use all six centers? Absolutely not! Choose the ones that you think will help your students the most. I prefer to start the year with task cards, roll and answer games, wildcard center, and math choice boards. Then, I introduce the others as the year goes on and add them to our centers, or replace them with a center occasionally. Ok. I have the math centers ready. Now, what? 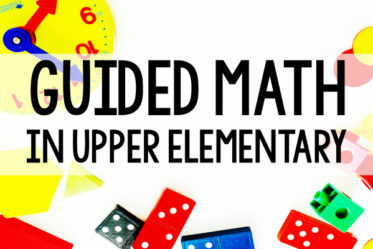 For more guidance on launching guided math centers (no matter what math centers you choose), click here to read a detailed blog post. Where can I download the free guided math centers starter pack? 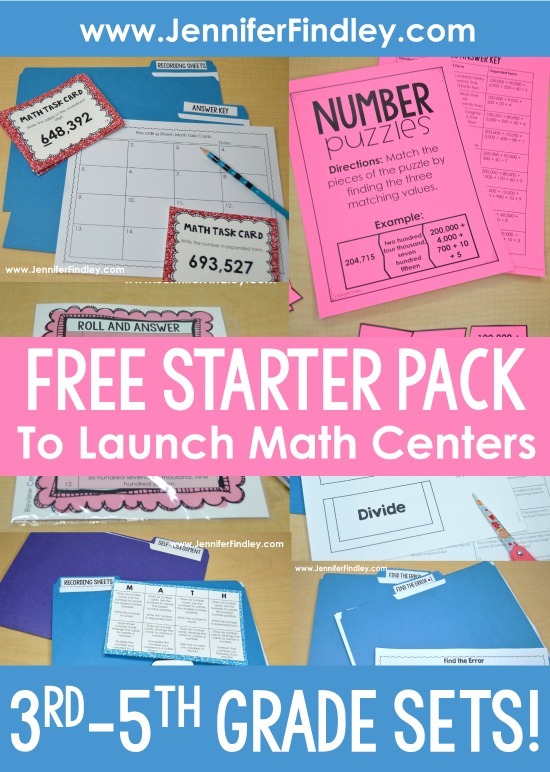 These math center starter packs are available for FREE in my TeachersPayTeachers store. Click on your grade level and you will go straight to my store to download the resource. If you use (or plan to use) these math centers, let me know in the comments. I would love to know how they worked in your classroom for launching guided math centers. Thank you so much Jennifer for allowing these Math Center Starter Kits to be available to us for Free!! 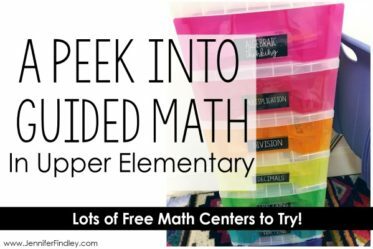 I’ve never used Math Centers in my classroom, but I’m so excited to try these!! You are welcome! I hope your students love learning with them! Thank you! These will be great to start the year off – may be purchasing more on TPT. 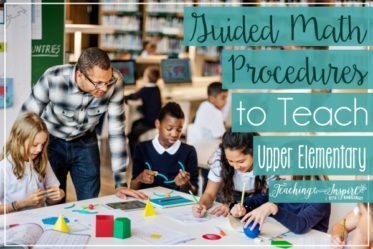 I am new to teaching upper elementary and I can’t tell you how much I have appreciated your detailed posts. I’ve been reading your blog for about an hour now. 🙂 Thank you for explaining in detail how you launch your centers and for the incredible starter pack. I’ve already put your centers on my wish list. Wow! What a generous starter pack! I recently purchased your task cards and I will probably purchase the other components soon. Thanks! Thank you so much for the time and effort you put into these resources! I am a resource teacher and am able to use materials from multiple grade levels – it is perfect for differentiation when my students are all working on similar skills!! Thank you for sharing all your knowledge and material. I am thankful beyond words! Hello? I love all your resources.I just bought 5th Grade Math Centers, 5th Grade Math Games in May. Are any of those games the same as the ones in the launching starter pack? THANKS! Thanks for the very easy to implement math centers. I plan to try centers this year for the first time. I have used your centers before and my students enjoy them. Thank you for making the starter packs available for free! I believe this will help me establish more effective math center time in my classroom! I love your posts and all your freebies! !